Jalapeños and peaches? In the same pie? Absolutely! The trick is making the jalapeños just a little sweet before adding them to the peaches–the results? Unforgettable! Even if you’re not a fan of all things spicy, you’ll enjoy the fiesta of flavors. 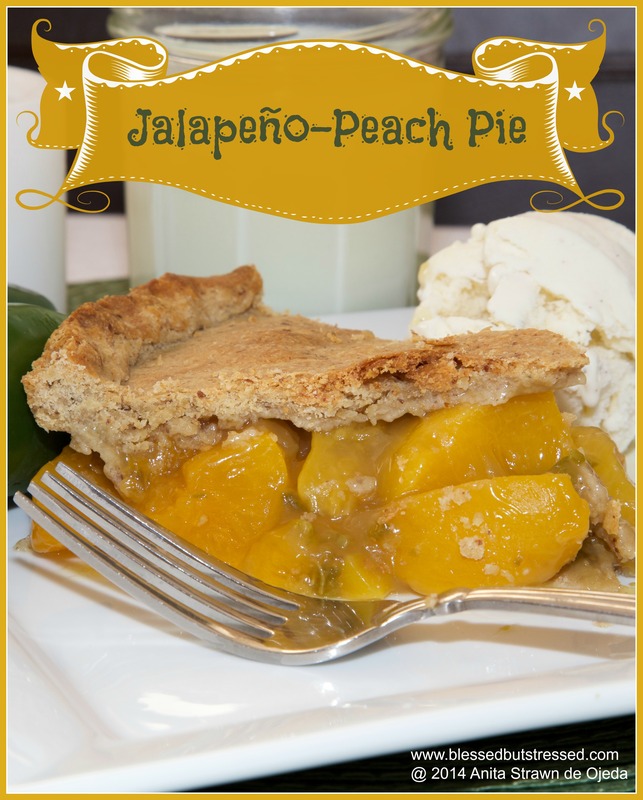 Find a fiesta of flavors in this unforgettable peach pie recipe–complete with jalapeños! In a large bowl, mix together flour, sugar and salt. With a pastry cutter or two knives, cut in the butter until the mixture resembles coarse crumbs. Mix together the egg, vinegar and water, then add to the flour mixture. Mix until the dough is moist enough to form a ball. Wrap the ball in plastic and chill for 30 minutes. Divide the dough in half. On a lightly floured surface (I put a little flour on some waxed paper) roll one half into a 12-inch circle. Press dough into a deep pie dish. Roll out the top crust (and place it in the refrigerator if it seems to fragile to handle). Add the peaches and brown sugar to the jalapeño mixture and give it a stir. Mix the peach juice (or water) with the cornstarch until it forms a paste, then add it to the peaches and jalapeño mixture and mix well. Bring the filling mixture to a slow bubble, stirring every once in awhile (you’re goal is to allow it to get hot enough to thicken before you put it in the pie). I used this time to roll out the pie crust. When the filling has thickened, pour it into the prepared pie crust and cover with the top crust. Trim the edges and crimp the sides together. Make sure you add some decorative vent-holes with a fork–because the filling is already hot! Place in the preheated oven and bake for 30 minutes (or until the pie crust looks golden).